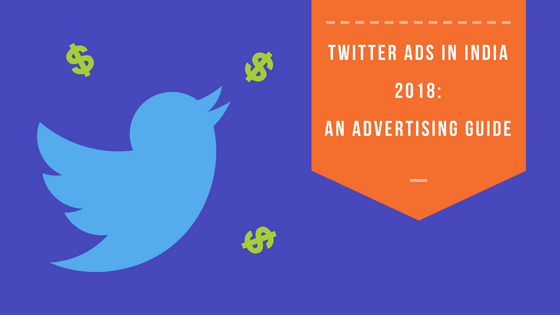 Twitter Ads India 2018 is an advertising guide which aims to walk you through the process of setting up ad campaigns on Twitter for successfully promoting your business on the platform. Advertising on Twitter can prove to be effective in reaching out to a wider audience as Twitter is a platform that has been used equally well by B2B as well as B2C brands. The statistics below from Statista, show the projected figures of the number of active users on Twitter by 2019. It is projected that the active number of Twitter users is going to cross the 30 million mark. 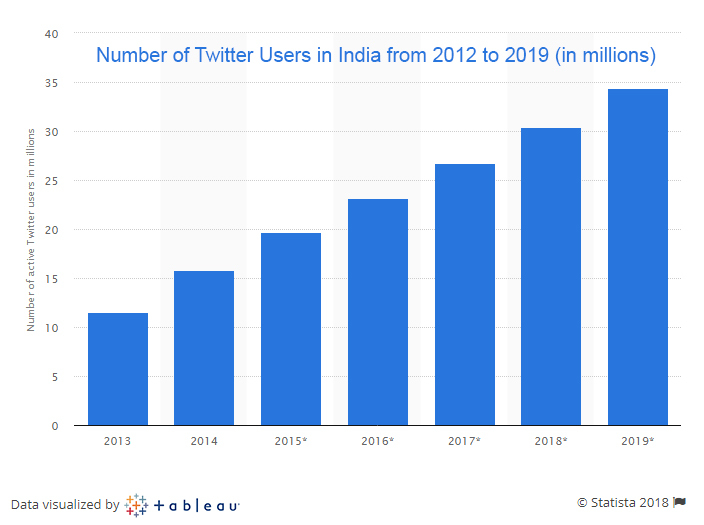 The Twitter India user base is the 2nd largest in the Asia Pacific region after Japan. Twitter is a micro-blogging service platform with an average of 335 million monthly active users world over. Many advertisers have observed that in some cases, placing your ad before a small set of an audience where the engagement rates are high, could give you a much higher ROI as compared to reaching a large audience that is not as engaged. While your brand might have a decent audience base on other social media platforms like Facebook, Youtube and Instagram; advertising on Twitter can be a fine way to step up your marketing efforts through being present at multiple platforms. Promoted Tweets– to display tweets to people who are not following you. Promoted Accounts– to increase your followers on twitter. Promoted Trends– to use a #hashtag to promote the most trending topics which appear on the explore page, in the twitter app and on user’s timelines. Twitter has eligibility criteria that advertisers should meet in order to be able to advertise on the platform. You should have a public profile and not a private account. Your Twitter account should be more than 15 days old. There have to be some tweets and basic engagement before you can start advertising. Your Twitter profile should have a proper profile + header image (not gif) and a website address in the bio section. The product that you will be promoting should be mentioned in the bio section. Furthermore, there are some other conditions like trade restrictions which need to be met that you can view here. After you ensure you have met the Twitter advertising criteria, let us go ahead and set up a campaign on Twitter. Based on what your business goal, there are 8 objectives you can choose from. Let us understand these in a little more detail. You can set up a Twitter ads campaign to increase your followers. These tweets appear on profiles if you don’t have an ad and tweet detail pages if you do. You can use this type of a campaign to run brand awareness campaigns but not from a conversion point of view. This is the only type of campaign that is priced using cost per 1000 views. This is the option to use for increases your website clicks and for increasing conversions. This includes a “Learn More” button which directs the viewer to your website. For conversions, you will have to install the tracking pixel or tag on your website. Next, you need to select a “key conversion event” like download newsletter, make a purchase etc. to set up the campaign. Choose your “cost per conversion” goal along with the campaign dates, domain name before you move to the targeting section. As the name explains, you can select these objectives to increase your app downloads or to make those who have downloaded your app to open and re-use it. This type of campaign helps you reach a wider audience who might be interested in your type of content. You get increased engagement in the form of likes, re-tweets, replies. It is a fine way to start a conversation with a brand new audience. Promoted tweets appear in search results. 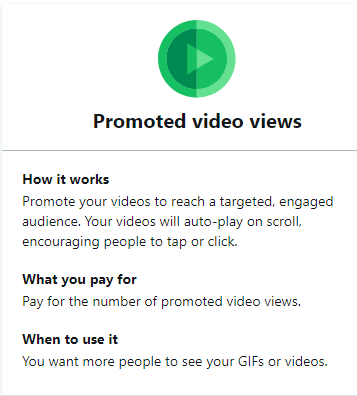 In-stream video views were launched by Twitter in India in 2017. In-stream video views are used to place your video ads before premium content partner videos. In both these campaigns, you are charged for each video view. Set up a total ad group budget if you like. It’s optional though. You can either choose to manually enter the Bid type or let it be automatically optimized by Twitter. 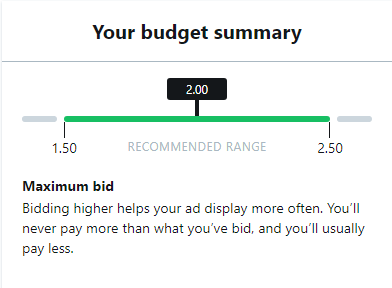 When you choose to bid manually, Twitter gives you a recommended range to help you select a suitable bid amount for your campaign. When you run Twitter ads, you are billed only when your goal is achieved. There is no minimum cost restriction for running Twitter ads. 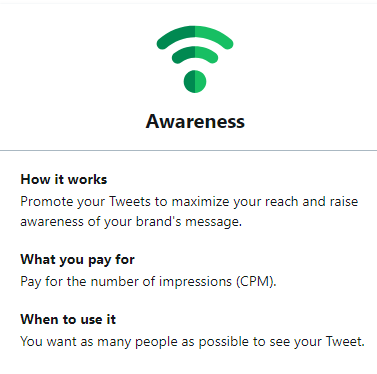 As, Twitter doesn’t offer the option to pay in INR, by default you will be making your payments in USD if you use Twitter Advertising in India. That means your advertising costs on Twitter will be constantly influenced by the fluctuations in the USD/INR currency rate. Though you can have a daily budget of as low as $1 per day, it is highly recommended that you choose your budget from the range provided by Twitter to be at par with the other advertisers in your niche so you can win at the ad auction. As you have seen above, every Twitter ad campaign has some billable and some non- billable actions. You are billed for the campaign objective that you have selected. 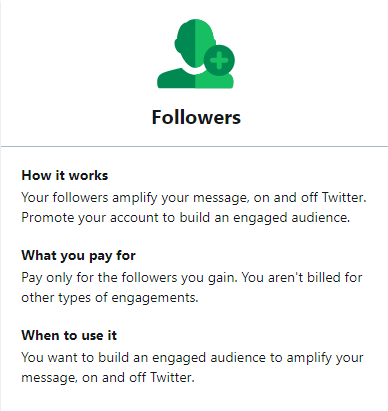 For example, say if you choose a campaign to increase your follower count, you will be billed for each follower you gain but not for any engagement or website clicks that you get. 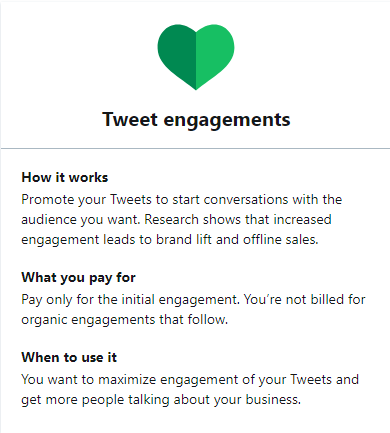 $1.5 to $2.5 per engagement which works out to the Twitter ad price in India being INR 100 to INR 175 per engagement. For growing account followers, website clicks & conversions campaigns- $2.5 to $3.5 per lead, conversion, follower= INR175 to INR 245. Promoted trends cost $200,000/- to $250,000 per day= INR 14, 00, 000/- to INR 17, 50,000/- per day. 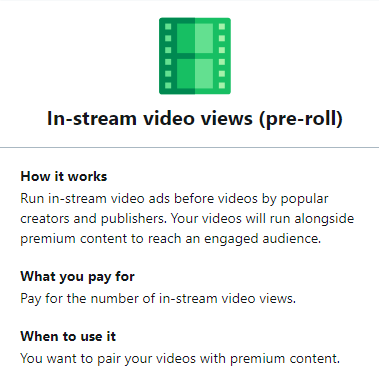 Instream video view costs are about $0.01 to 0.10= INR 0.7 to INR 7 per view. When you upload your creative, on the left side of the screen, you will be able to select where you wish to place your ad. You can alter the ad placements in this section if you wish to. Since July 2017, Twitter has increased their character limit to 280 words. As you are aware, you can add various cards to your tweet which include images and videos, audio to grab more attention. 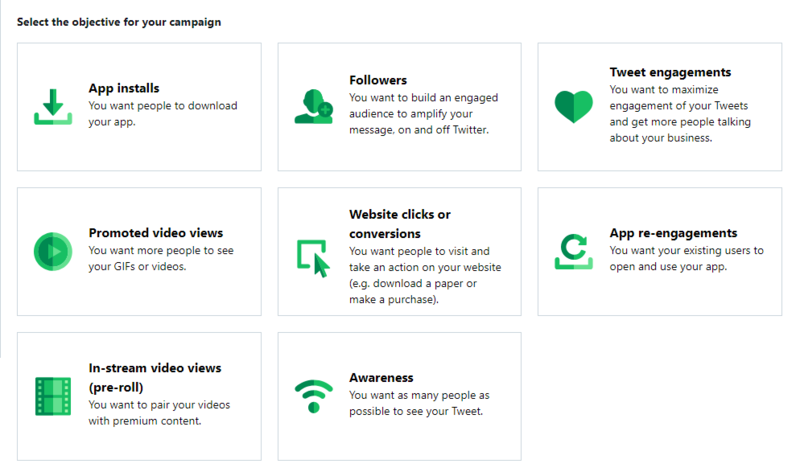 Twitter Ads Specs 2018 can be accessed here https://business.twitter.com/en/help/campaign-setup/advertiser-card-specifications.html on the Twitter website. Most of the targeting features in Twitter ad campaigns are similar to Facebook or any other campaign. 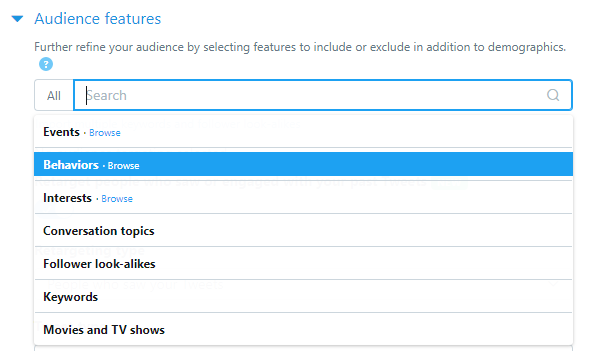 Tailored Audience– You have the option to upload your own specific list of audience you wish to target. You can target by age group, gender, interests, location, technology etc. 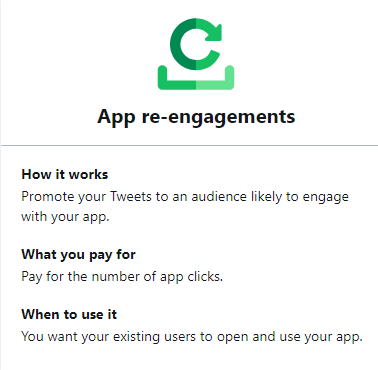 Besides the usual, there are some additional targeting features you can make use of to widen your reach to target the followers of other Twitter accounts you wish to target. You can even choose to target audience using specific keywords or target audience who watch some specific television shows. You can either opt for maximum reach or reach with engagement. After you are done with selecting your target audience, you can launch your campaign. Don’t forget to set up Analytics to monitor your ads for further optimization. 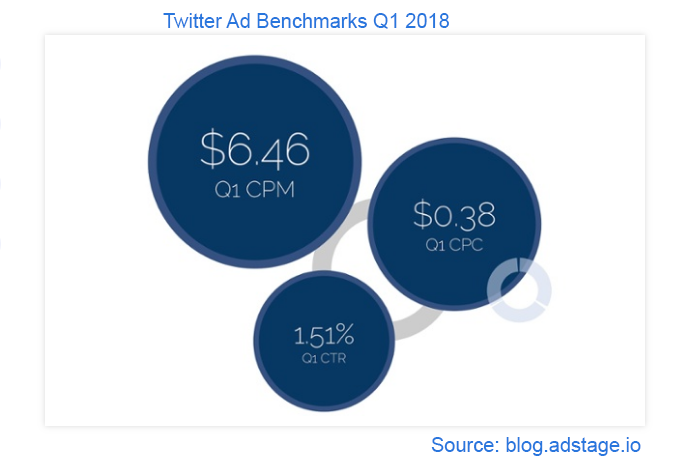 Adstage analysed about 300 million Twitter ad impressions and over 8 million clicks to come up with this data for Quarter 1 of 2018. The cost per click for Twitter ads is $0.38 and the click-through rate (CTR) is 1.51% with a $6.46 CPM. Access the Twitter Ads Policy here. 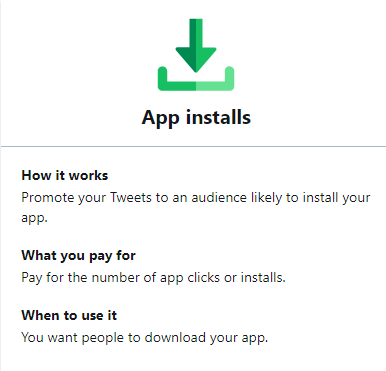 Avail Twitter Ads Support if you feel the need to do so. Twitter has launched a free training course by the name of “Twitter Flight School” for learning Twitter advertising to which you can gain access here. What Twitter lacks in terms of reach when compared to Facebook and Google, it has the potential to make up for in terms of ROI if you have a highly engaged audience on the platform. You would be surprised to know that the New York Times has only been using Twitter Ads to run their ad campaigns. They have never run an ad on Facebook. Similarly, in India, Twitter is one of the most important and active social media platforms during the IPL (Indian Premier League). Almost all the sponsors of the event use social media campaigns http://www.adageindia.in/digital/ipl-2018-top-10-brand-campaigns-on-twitter-during-week-1/articleshow/63934595.cms to extend their audience reach. It’s not just IPL, big brands like Fiama Di Wills and Fiat have successfully managed to increase their reach and visibility on social media through advertising on Twitter. 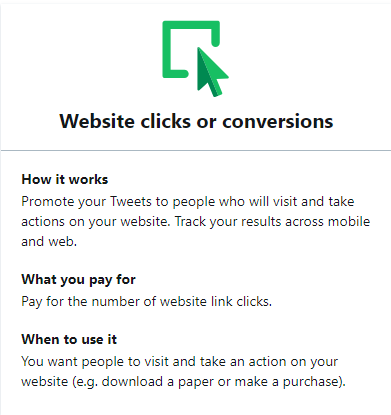 If you’ve never run Twitter Ads, you can try them out using a small budget and give them a month’s time to see if they work for you. Maybe they could help you gain a wider target audience on the platform by combining paid and organic efforts. Was this article useful? …Please let us know in the comments section below.